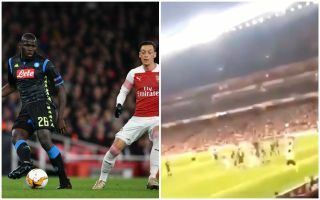 Arsenal secured a 2-0 win over Napoli on Thursday night, but a video seemingly showing a ‘fan’ aiming a racist slur at Kalidou Koulibaly has made headlines. The Gunners will take a two-goal advantage into the second leg of their Europa League quarter-final tie in Naples next week, with a goal from Aaron Ramsey and a Koulibaly own goal putting them in a strong position to advance. However, the club have had to address another matter that took place in the stands during the game, as seen in the video below, as a fan has aimed a vile racist slur at Koulibaly and moronically shown his face which should help identify him to take further action. As noted by Sky Sports, the Gunners have now launched an investigation and released a statement to clarify the next steps that they intend on taking. “We utterly condemn use of this type of racist language and have launched an investigation to identify the culprit,” the statement read. Time will tell if they are successful in banning the ‘fan’ in question, as they will hope to take swift action and switch the focus for all concerned back to matters on the pitch as the number of reports of racism is seemingly going up within the sport over the last month. As well as hoping to book their place in the last four of the Europa League next week, Arsenal remain in a battle for a top-four finish in the Premier League and Unai Emery’s side face some crucial games within the next month.